When we will plan to purchase a laptop then HP Brand comes to our mind. Hp is a most popular brand in world wide. HP Pavilion 15-au623tx is a most powerful and professional laptop from HP.now we come to the details. In HP Pavilion 15-au623tx laptop, comes with a 15.6-inch HD screen of resolution (1,366 x 768 pixels) HD SVA BrightView WLED-backlit. The CPU power by Intel® Core™ i5-7200U (2.5 GHz, up to 3.1 GHz, 3 MB caches, 2 cores). It comes with 8 GB DDR4-2133 SDRAM (1 x 8 GB) and NVIDIA® GeForce® 940MX (4 GB DDR3 dedicated) graphics card. The laptop comes on Windows 10 operating system with 64-bit architecture and Microsoft Office H&S (Lifetime Version). The laptop is well designed in a silver coloured polished body which is very shiny and glossy. Its look is as like a MacBook. Its dimensions 38.3 x 24.3 x 2.25 cm and weighs 2.04Kg. it has Full-size island-style backlit keyboard and HP Image pad with multi-touch gesture support. You can get the storage for your files in the 1 TB 5400 rpm SATA hard disk which is provide by HP. on the other hand you can get the energy power of 2-cell, 41 Wh Li-ion Battery. Which give you a huge power back up for your daily work. For the feeding of your battery you got the 65 W EM AC power adapter. In this laptop has a good clarity webcam and inbuilt dual array digital microphone for video calling and recording needs. On the connectivity you can get 1 HDMI, 1 headphone/microphone combo; 1 USB 2.0, 2 USB 3.1, 1 RJ-45,1 multi-format SD media card reader in the both side of the laptop with well designed. When we come to the Wireless feature you can get Intel® 802.11ac (1×1) Wi-Fi® and Bluetooth® 4.2 Combo (Miracast compatible) with Integrated 10/100 BASE-T Ethernet. On the other feature you will get the Stereo speaker of B&O PLAY. When we will come to Security management we will get Kensington MicroSaver® lock slot, Power-on password, Accepts third-party security lock devices, Trusted Platform Module (TPM) support. The HP Pavilion 15-au623tx is a high-end laptop we recommended for all professional users for multimedia editing projects and for the people who loves High end games. It has a good power for multitasking. You can also go for this model for your daily work. 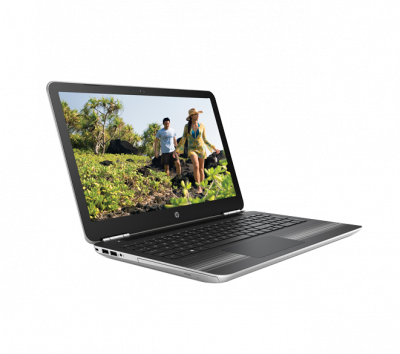 Its battery backup is excellent.it is a middle range laptop for all user. It’s a worth buying and one of the best laptop delivered from HP family.